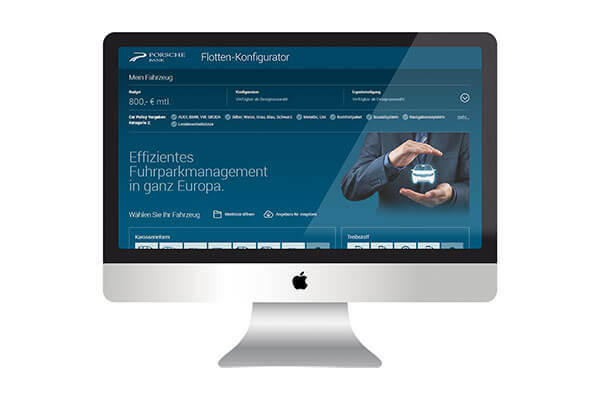 The Fleet Car Configurator is an application for large customers of Porsche Bank. The drivers of company cars at these companies can log into the system, configure their desired new vehicle online using multimedia tools and request a quote for a finance proposal by Porsche Bank. At the click of a button, the system shows the user whether the desired company car suits the budget and the company’s requirements. This saves valuable time and money. If the desired vehicle does not match from the company’s car policy, the fleet manager can still approve the purchase. This procedure is not restricted to the brands of Porsche Holding Salzburg; other brands can also be configured in the system. Data for these models is retrieved from EuroTax. The proposal data for the approved vehicle is used as the basis for the sales meeting and forwarded to the respective dealer and to Porsche Bank by email.